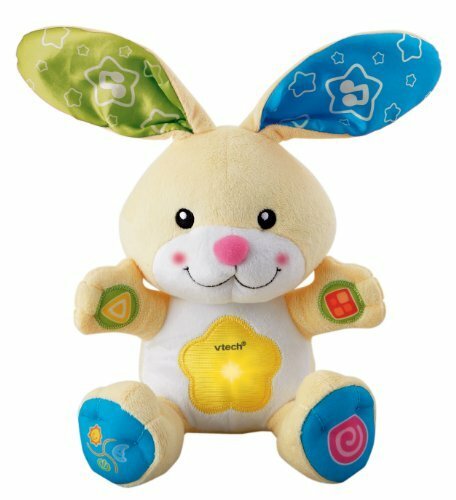 Easter toy and book gift ideas for 1 year olds. Should a 1 year old be given chocolate? This question is important for Easter gift giving. Most people feel a 1 year old is too young for lots of chocolate that is normal for Easter. Some parents even want their child to go chocolate free at this age. So what do you buy a 1 year old for Easter instead of chocolate? Alternatives to Chocolate for 1 Year Olds? Not giving a 1 year old chocolate for Easter can feel like you are removing the fun from the holiday. But Easter can still be special without relying on lots of candy and chocolate. 1 year olds are thrilled with any surprise they find in their Easter basket. But giving gifts that still have an Easter feel can feel more special than giving any toy or gift. The problem is you probably don’t know what to buy a 1 year old that feels like Easter but is not chocolate? How Much Chocolate Should a 1 Year Old Get for Easter? 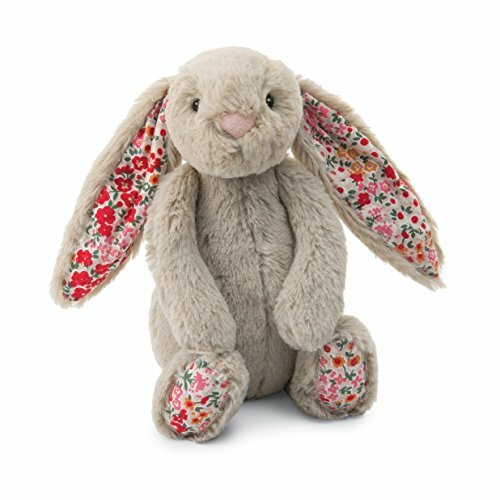 A soft toy bunny is the most obvious Easter themed toy because of its connection to the Easter Bunny and luckily is the easiest to find. 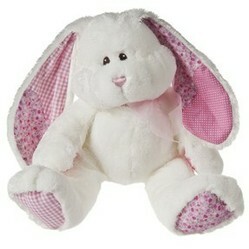 A soft toy is cuddly and perfect for hugs which make a young child feel safe and secure. Pretend play will soon become part of a 1 year old's playtime (if it is not already). So a soft bunny is a new friend too that they can whisper too and share adventures with. There are lots of toy bunnies about - just make sure that they are recommended for babies like these three are to make sure they are safe. Everybody knows bunnies and Easter go together but do you know why? The Easter bunny comes from an ancient goddess of spring and fertility called Eostra. She had the symbol of a rabbit. In the Medieval time the Roman Catholic Church included this rabbit symbol into the Easter celebrations. This was to include beliefs from the local people into religious celebrations. This symbol of new life, fertility and Spring became the Easter Bunny you know now. If you want something more creative than a bunny for Easter it's time to look at other Easter symbols. Ducklings are symbolic for new life which is an important Theme for Easter. The Musical Duck is suitable 1 year olds who have just had their birthday. For slightly older 1 year olds (around 15 to 18 months) who are taking their first steps the Pull Toy Duck and Babies is perfect. 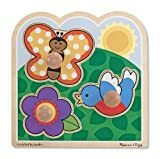 If you are want something that is not a duck or a bunny the "In the Garden" Jumbo Puzzle is a great first puzzle with an Easter theme (a butterfly) that won't be too hard for a 1 year old. Why Ducks and Butterflies for Easter? You have seen ducklings on Easter cards. They are an Easter symbol because they are associated with new life and new beginnings. New life and beginnings are important to Easter because they are symbols of the resurrection. I’m sure you know caterpillars change into butterflies. Because of this they are a symbol of transformation and resurrection. The butterfly is less common than bunnies, eggs and ducks for Easter but it is still a symbol of this holiday. This means gifts with butterflies are a good choice for an Easter gift. Easter books are excellent for a 1 year old and it's best if they DO something. Playing with a book rather than just listening to a story is gives a young child a feeling of discovery and awe. "Where are Baby's Easter Eggs" has flaps to open giving lots of surprises to a 1 year old. "Touch and Feel Easter" has different textures to feel and discover which makes reading an adventure and encourages a love of books. 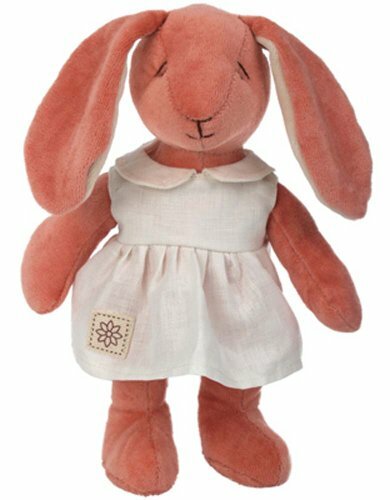 Easter gift ideas for baby girls from newborns to 1 year olds.